Nato supply convoys travelling through Pakistan to Afghanistan have regularly come under attack in the past, but following Pakistan's decision to block their route through the Khyber Pass, they now face an even bigger security threat. Hundreds of tankers and trucks have been left stranded on highways and depots across Pakistan, with little or no security. Taliban militants have regularly been targeting the convoys, even when they are heavily protected. But many believe it is not just the militants who pose a security threat to the convoys. The owners of oil tankers being used to supply fuel to Nato in Afghanistan say some of the attacks on their convoys are suspicious. They say there is evidence to suggest that bombs have been planted in many of vehicles by the "Nato contractors" - individuals or companies who have been contracted by Nato to supply fuel and goods to forces in Afghanistan. The contractors subsequently hire the transporters who then carry the goods. Dost Mohammad, an oil tanker owner from Nowshera district, said a Nato contractor had recently been caught trying to plant a bomb in an oil tanker. "This happened in the area of Paiyee, when he was putting the bomb under the vehicle." "At that time, a few men also opened fire on the tankers. The deputy later told the police that he had been told to plant the bomb by the contractor." Dost Mohammad said the contractor had apparently sold off the fuel first. "Only 2,000 litres from the original 50,000 litres had been left in the tanker to cover up the crime," he said. Dost Mohammad said it is a win-win situation for the contractors. "If an old vehicle is burnt, Nato gives them money for a new vehicle. In addition, they receive compensation for all the fuel lost as well." But the Deputy Minister for Interior, Tasneem Ahmed, dismissed the transporters' claims. "We have no such information that the Nato contractors are themselves setting the tankers on fire," he told the BBC. "No such complaints have been lodged, to my knowledge." The BBC also spoke to a Nato contractor, who was similarly dismissive of the allegations. Speaking on condition of anonymity, he said Nato insured all the goods being transported and the vehicles carrying them. "Nato pays the premium and bears the relevant charges with the local companies who provide the schemes. The transporters are then reimbursed on the basis of their actual losses," he said. But he said the policies were only valid within Pakistan. But Nowshera's police chief, Nisar Tanoli, had a different account of events. • About 150 lorries go via the southern supply route through Chaman to Kandahar. 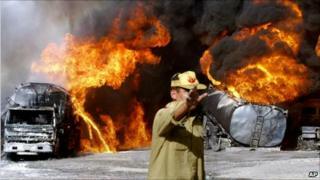 Talking to the BBC, he confirmed that at least two attempts to blow up oil tankers had taken place in the district. "One took place in Paiyee, and the other in the area of Watak near Akora Khattak," he said. "In both incidents the tankers were parked in the area for a couple of days. During this time, bombs were made in nearby houses and then used on the tankers." He said the contractors were "in a hurry" to get a copy of the initial police reports into the incident and were "not interest in prolonging the investigations". "The insurance agents also showed up a few days later," he said. Mr Tanoli says the police carried on their investigations and the facts eventually came to light. "We have now arrested some drivers and their helpers," he said. "The people behind them are not residents in the district, but we have issued warrants for their arrest." He added that there have been incidents in which fuel for aircraft has been sold off. "The contractors later said it had leaked, or the tanker caught fire." All, then, is not as straight forward as it seems, as far as the threat to the Nato supply route is concerned. But despite these additional concerns, the main danger continues to come from the Taliban. "We are very scared at the moment - we are an open target for the militants," said Israrullah Shinwari, a spokesman for the All Pakistan Oil Tankers Association. "Since the blockade was enforced, we have 3,000 tankers stranded across Pakistan." "The blockade itself has cost us tens of millions of rupees in losses. This does not include the damages suffered in the attacks. "The Taliban have openly declared they will target the tankers, but we have been provided with no security." Since 2007, the militants have destroyed or captured dozens of Nato transport vehicles, especially in the Khyber tribal region. But a security analyst said the latest move was "tantamount to encouraging the militants to have a real go at the convoys". "The fact that government ministers are calling the attack an expression of public anger shows that some may just be payback," he said. "Pakistan's intelligence and security apparatus may be encouraging the attacks by looking the other way. In fact, there are suggestions that agencies may themselves be behind some themselves."